Condenser Services to Improve Condenser Performance | Intek, Inc. The condenser is often referred to as “the biggest job-related headache” by many power plant personnel. Due to its sheer size, hundreds of penetrations, and dozens of seals, just finding an air in-leak can consume several manhours and be very costly. Even after repairs have been made, air in-leakage is low, and pump capacity is normal, many plants operate with excess back pressure, high DO, and low heat transfer coefficients. The result is poor heat rate and lost load. Plants that experience these problems are candidates for Intek’s unique Power Plant Condenser Service offerings. 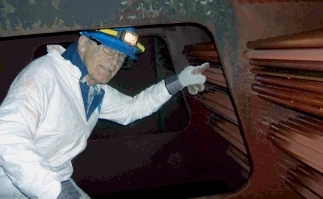 Intek’s Condenser Services are based on a solid foundation of physics and engineering principles, and utilize unique and Intek-patented methods to identify and correct condenser deficiencies. Intek has a step-wise approach to improving condenser performance to ensure that plants get economic results. With each step, the decision to continue is made by weighing the available information to assess the magnitude of the problem, the cost of the solution, and the benefit of the improvement. As an example, a customer who incorporated our engineering modifications saw a 1″Hg reduction in back pressure with a 77 Btu/kWhr reduction in average heat rate View the detailed results here. Learn more about all of the services Intek offers to assist with your condenser performance issues in our Condenser Performance Solutions (PDF) booklet. Submit your inquiry using the Request A Quote form on this page to send us information about your process and concerns. You can also Contact Us by phone or email to discuss your condenser issues.